If you’re new to the band or just feeling like a catch up, this page will bring you up to date with an overview of the Kajagoogoo story. To begin, we go right back to the end of the seventies and into the early part of the eighties. Before the band became Kajagoogoo, they were a four piece outfit consisting of Nick Beggs, Steve Askew, Stuart Neale and Jez Strode. Known around the local gig circuit as The Handstands, they were also working under the name of ‘Art Nouveau’ as they tried to make it big and get that elusive record deal.They released only one single, Fear Machine which was a limited pressing of 1000 copies. This track was played by John Peel and was record of the week in Sounds magazine but still, no record deal was forthcoming. An album was also rumoured to have been made by the band but this was only available as a bootleg and is very hard to find now. This album has been dismissed by some as a myth, but ‘Live’ by Art Nouveau does exist. The style of this album was very different to what later became the Kajagoogoo sound. Many of the tracks were sung by lead guitarist Steve Askew. That lead singer was exactly what the band needed and was of course, Limahl. During a 1982 gig at the Embassy Club in London, the band were spotted by Nick Rhodes, of the band Duran Duran. He liked what he had heard and requested a demo tape. This tape was given to EMI Records, the label that were to sign up the band who were now known as ‘Kajagoogoo’. Produced by Nick Rhodes and Colin Thurston, the band recorded their debut album White Feathers from which they lifted debut single Too Shy in January 1983. It was to reach No.1 in the UK charts and also hit the top spot in seven other countries, also reaching No.5 in the USA. This was to catapult the band to worldwide fame. The band performed a very successful tour of the UK in 1983, ending the tour with two sold out nights at the Hammersmith Odeon London. This show was released on home video on VHS/Betamax/CED & Laserdisc formats. The follow up singles ‘Ooh to be Ah’ and ‘Hang on Now’ were released shortly after in April and June respectively, each obtaining a Top 10 position in the UK charts. Later in 1983 and in an effort to remove the bubblegum pop image they were stuck with, Kajagoogoo parted company with Limahl, and continued as a four piece band, changing their musical direction and adopting a more matured approach. In 1984, they released the album Islands, attracting both commercial success and critical acclaim. This album included the hit singles ‘Big Apple’, ‘The Lions Mouth’ and ‘Turn Your Back on Me’. The band toured the album and held a very strong following in Japan. The bootleg album ‘Live in Tokyo’ was released and in later years became available officially via the band’s official store. The album ‘Islands’ was renamed Extra Play for the US market where the band were known as ‘Kaja‘. In 1985, Jez Strode was to leave the band and ‘Kaja‘ as they were now universally known decided to continue as a three piece band. Kaja recorded their third album, ‘Crazy People’s Right to Speak’ in California and released the hit single, Shouldn’t Do That in 1985. The album had less commercial success than the previous albums and the band decided to part company in 1986. Kajagoogoo were not to re-unite publicly until 2003, when they were involved in a show for VH1 called ‘Bands Reunited’. This show involved persuading all five band members to agree to a special one off gig to reunite and play once again as ‘Kajagoogoo’. Surprisingly, all five members agreed and they got back together for a show at the ‘Scala’ in London. Unfortunately, the band were not able at that time to agree upon an arrangement to stay back together, and this event did prove to be a one off, at least for the time being…. In 2004, the three piece band (Beggs, Askew and Neale) worked on a track called ‘Tears’ for a compilation album called ‘This is not Retro’. This was followed by the first new Kajagoogoo single since 1985, albeit as a three piece band. That single was Rocket Boy. Later in 2007, US record label, ‘Spectra Records’, approached the band offering a deal for a new album. The three piece band put together an album to be released in 2008/9 – this album was to be called Gone to the Moon. Changes were on the horizon that meant the album was not to be released as planned. Bradley Snelling had originally persuaded the three piece band to come back together to play at the Retrofest festival (which they opened – to an incredibly appreciative audience). After the success of ‘Retrofest’ and following discussions with Nick Beggs, Snelling persuaded the full five piece band including Jez Strode and Limahl to reunite, and in February 2008 Kajagoogoo held their first photo shoot in 25 years. With new manager Snelling at the helm, the band began to make waves once more. Under his guidance, a successful tour of Germany was to follow, and in support of this the band was to become a major presence on television and radio all over Europe. The organisation that the new management structure had brought to the band began to reap its rewards, as Kajagoogoo sold not only tickets, but also a range of reunion merchandise. For fans, the good times were back. This, of course, changed the dynamic. The deal with Spectra Records was not completed and Gone to the Moon album was initially given away as a free download as a gift to the fans that had remained so loyal to them. And loyal they indeed were, shifting over 10,000 copies in the first month of digital release. The album is now available as a physical CD, and on iTunes on digital download. The five members of Kajagoogoo went on to delight their fans around Europe and Scandinavia with a series of shows in 2008. The band then announced two dates at ‘The Stables’ theatre in the UK for December 2008. This was the first time that a British audience was to see the original five piece band on stage since 1983. Introduced by Paul Gambaccini, the show was a hugely emotional event for the UK fans, who had waited so long to see the band like this again. In a cruel twist of fate for the band, Bradley Snelling was to remain manager for a mere 18 months, as business issues surrounding the Retrofest festival were to divert his attentions elsewhere…. The band released a four track EP entitled ‘Death Defying Headlines’ which was a huge success with the fans who were delighted to finally get new material from the band. A new retorospective of the band was released in September 2009 by EMI, this CD/DVD was called ‘Too Shy, The Best of KajaGooGoo and Limahl’, available from the Kajashop, as well as all known outlets. The tour proved to be a great success, being well attended by eager fans. Importantly, it also earned Kajagoogoo some very complimentary reviews by the music press. The band performed once again at ‘The Stables’ venue in December 2009, leaving fans wanting more. This was to be the last performance in the UK by the band until they played at the Midlands Music Festival in July 2010 and again at the Rewind Festival in August 2010. In May/June 2011, KajaFax worked with KajaGooGoo and Red Dot Music to release ‘Death Defying Headlines’ as a digital single. It was a wonderful experience for us. 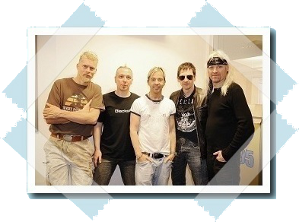 The KajaFax team were interviewed live on radio stations, appeared in newspapers, and even appeared on UK TV with Limahl and Jez. Although it is a quiet time for the band right now, the guys are very busy as individuals. Steve Askew has been working with UK vocalist ‘Lu Cozma’ and together they released the critically acclaimed album ‘Red’. Steve has a solo album ready for release in 2016, and also performs regularly with the self proclaimed “Band for all seasons” Bad Hombre. Nick Beggs is a musician in hot demand, playing bass and Chapman Stick for other 80s musicians such as Howard Jones and Kim Wilde. In 2013, he recorded the prog rock album Lifesigns, which hit both the stores and the album charts. During 2014, Nick was a part of Steve Hackett’s mammoth ‘Genesis Extended Tour’; a tour that saw the Beggion perform to audiences in America, Russia, Scandinavia, the UK and mainland Europe. In August 2014, Nick also played some intimate contemporary jazz gigs in central London together with Jason Carter. He toured the world with Steven Wilson in 2014 and again for the ‘Hand Cannot Erase’ tour in 2015. Nick’s latest project (the first to feature a Nick lead vocal since Kajagoogoo), release their debut album in January 2016. You can order The Mute Gods: Do Nothing Till You Hear From Me HERE. In May 2015, Limahl performed to 16,000 people at the Ericsson Globe Arena in Stockholm, Sweden as a part of the ‘Celebrate the 80s and 90s’ extravaganza. Moving on into 2016 and Limahl already has a packed diary, as fans are treated to a series of gigs over the UK and Europe. Further afield, 2016 also sees Limahl performing live in a series of eight shows in Australia. And so, this brings us up to date in the history of Kajagoogoo. With the 30 year anniversary of both the White Feathers and Islands albums having now passed, all fans are waiting for the announcement of more Kajagoogoo live performances and maybe some new studio material. Showing your support for Kajagoogoo is one way of letting the band know that the fans are here and we want more! You can do your bit by commenting on the site, following us on Twitter @KajaFax, or ‘liking’ us on Facebook.